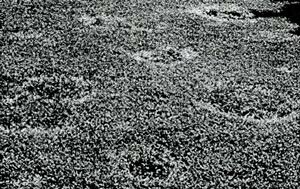 There is a deadly disease circulating amongst bluegrass lawns known as Necrotic Ringspot. It looks like fairy ring without the mushrooms. It grows in a circular pattern creating a dead (brown) circle. This circle continues to grow creating a “frog’s eye” center where the center is green. If left uncontrolled it will take over your entire bluegrass lawn. It is transported by mechanical (lawnmowers, aerators), foot traffic, and water. Chemical control is limited and short lived. Fertility levels need to be closely monitored. There aren’t really resistant varieties of bluegrass on the market. So, what is the best remedy? Seedilizing with perennial ryegrass. But, just not any perennial ryegrass will work. Through years of research and development we have brought together the finest varieties of perennial ryegrass which are resistant to Necrotic Ringspot. These varieties will control the advancement of Necrotic Ringspot into other parts of your lawn. They will control the ugliness associated with the brown circle of Necrotic Ringspot. NRC is fast germinating and doesn’t spread into adjacent shrub beds. 4. Seedilize entire lawn with NRC at the rate of 10#/1000 sq ft.
7. Apply starter fertilizer after 2nd week. 8. Mow after 3rd week.